This piece is about 10 printed pages long. It is copyright © Tina Giannoukos and Jacket magazine 2010. See our [»»] Copyright notice. Angela Gardner’s Views of the Hudson explores being a visitor in New York in the first decade of the twenty-first century. Gardner is also a visual artist. The collection’s painterly title reflects this, as does the image in blues and whites that graces the cover. Moreover, the visual acuity and even linguistic precision of the poems reflect this. The title suggests a multiple rather than a single or even panoramic view. The image, which comes from Gardner’s nine-panel monoprint, Vertical Coast, suggests the view of a city from a boat or, perhaps, its reflection in water. Subtitled A New York Book of Psalms, the collection invokes the sacred, putting into circulation the origins of the Americas in utopian imaginings and, in particular, New York’s status as the city of many hopes. 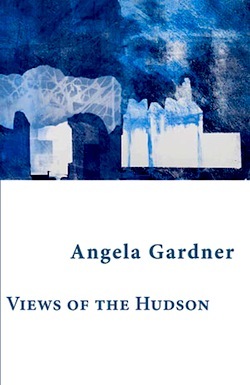 In literature accompanying the release of the book, Gardner writes that before she began Views of the Hudson she had been reflecting on “the intoxication and dangers of believing in Promised Lands”. What she wished “to recreate in poetry was the flood of images that results from living in an overcrowded information-rich city”. it was what we were looking for yes? here where I stand and the city doesn’t stop! The poet, however, often figures her relationship to the city not only in terms of utopia/dystopia but also in terms of the sacred and the profane: “in the valley of salt/where I am high as a kite one minute/and lost the next” (8). Thus, she takes her “place surging with the crowd” even if “the trees may just be monochrome/ink stained after a spectacular Fall”. The word “Fall” here is both a season and a sentiment. In a Nota Bene, Gardner declares that these sonnets, with their uneven line count, are nevertheless sonnets in that she counts them as possessing fourteen lines, that is, she counts the gaps as lines also. Leafing through the book, one perceives sonnets, even when the line count appears short or the lines themselves are truncated. In other words, in their semblance of regularity, the gaps functioning to put back what is missing, that is, the line itself, these poems look like sonnets. They read and sound like sonnets. The poems possess a sonnet’s philosophical mood. The Nota Bene, however, invites a discussion. This discussion is less about the poems themselves, their success, and more about a gap as a line. If it can function as a line, then what is the effect of a gap as a line beyond appearance? Why even note the gap or even circumscribe its meaning? The difficulty is that if the poet makes no note about it the reader, much less the hearer, of these sonnets may not tease out the sonnets in the way the poet intends, perceiving the gap as merely that. The problem, however, is how to register the gap as a line and not simply a play in visual space. Still, poets have been making silence visible in their poems and not simply referring to it for a very long time. The poet e.e. Cummings, himself a maker of exquisite lyrics and a painter, not only refers to silence in his poems, as does Gardner, but like Gardner makes that silence visible to the eye by such visual devices as blank spaces between words. In the lyric, these visible silences, gaps, and absences that also colour Gardner’s own poems take on an added aura. Gardner repeats her silences throughout so that on the flight over “screens flutter mutely” (1). On her arrival “in the crowded terminal at JFK” (3), the poet says “I can hear the uncomfortable silence/in all this noise” (3) where “a voice divides space/days surrounded by strangers” (9). Gardner’s statement on poetics counter-intuitively positions the sonnet, a closed form, within that body of work that foregrounds visual space, making a distinct visual prosody a part of these sonnets’ formal arrangement. In this, Gardner partakes in an experimental approach to the sonnet throughout the twentieth century in which we sometimes barely identify the sonnet. In positing the gap as a line, Gardner interrogates even a sonnet’s safe docking in its harbour of 14 lines, where each line consists of words, not gaps. She does not thereby abandon aurality in favour of the visual, even if the problem of how to articulate the line as a gap remains. Nevertheless, a question remains. The regular appearance of the sonnets, the gaps usually making for 14 lines, gives the illusion of a traditional sonnet, which the gaps as lines subvert. Where we expect a line, we see only a gap that, however, we may not necessarily perceive as a line. These phantom lines intensify those silences and absences that haunt these poems. The accretion of the gaps as lines from poem to poem enacts their effect. In their presence from sonnet to sonnet, their varying appearance within the sonnets themselves, now a gap here, now a gap there, these gaps that count as lines are suggestive of the absences that haunt this city, even mark its vulnerability. It makes present the absence brought about by destruction or the fear of its threat. The gaps gesture towards and even make present that absence that marks New York itself: the destruction of the World Trade Center Towers. … so why won’t it work anymore? into the safe suspended warmth of belief? In conclusion, these sonnets make for an intellectually provocative collection, the virtuoso play of images and language superbly executed, and the shifting perspectives offering potentialities of visions and ideas. 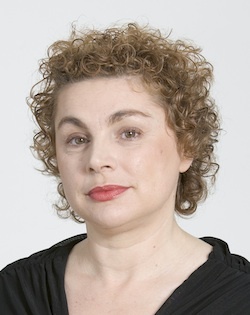 Tina Giannoukos is a poet and fiction writer. Her first collection of poetry In a Bigger City is published by Fives Islands Press. She is completing a PhD at the University of Melbourne. Her poems have been published widely, including Blue Dog and Blast.